Finance Minister Arun Jaitley on Thursday sought to debunk the view that demonetisation impacted the economy and dismissed criticism that the government only promoted jobless growth in the past three years. At a media conference here on the completion of the NDA's three years in office, Jaitley asserted that there were several factors even before demonetisation like global slowdown which cumulatively impacted the economy, especially in the last quarter of FY 2016-17. Jaitley said the criticism of jobless growth was a propaganda by opponents who had nothing substantial to comment on the government's performance. He sought to dispel doubts about the roll out of Goods and Services Tax (GST) on July 1 as scheduled. The Finance Minister said the government had, in the past three years, left an impact in three areas -- capacity to take decisions, even tough ones; clear direction in decision making; and allowing market mechanism to ensure transparency and maximum revenue in allocation of public resources. "What you think is very clear, is not clear. Let us not be guided by erroneous premises. There are several factors which can contribute to GDP in a quarter," he said in reply to a question whether demonetisation had an effect "which was very clear" from the GDP numbers released on Wednesday. "There was some slowdown visible even before demonetisation in the last year. There was impact of global factors. There could be some impact on two quarters (due to) the issue which you mentioned," he told the questioner. The latest figures released by the Central Statistics Office on Wednesday showed the country's GDP growth during the last quarter fell sharply to 6.1 per cent, while it grew at a lower 7.1 per cent in the full fiscal 2016-17, from 8 per cent in the previous year. Buttressing his point, Jaitley said the services and financial sectors, which normally grow at around 9-10 per cent, had a fall in growth even before demonetisation was announced. "These are cumulative factors that too play a role. A 7-8 per cent growth of the economy has become the Indian normal, which is good by global standards and fairly very reasonable by Indian standards," he said. He also dismissed a reporter's view that the Goods and Services Tax (GST), proposed to be rolled out from July 1, could also slow down the economy. Chief Economic Advisor (CEA) Arvind Subramanian intervened to say that the GST could actually result in decreasing price inflation and increasing spending. On the opposition criticism of jobless growth, Jaitley said that "for some, it is propaganda material". "In the beginning, they said it is incremental reforms and not big reforms. After GST, now they say it is jobless growth. Jobs are created when the economy grows... jobs are created in the formal and informal sectors. In the informal sector, there is no survey (of jobs created)." Giving an overview of three years, Jaitley said the NDA came to power against the backdrop of global slowdown and shrinking economy when the country had gone off the global radar, besides three years of poor rainfall. "What we inherited was that there was lack of credibility of the government because of corruption and indecisiveness." Jaitley scotched doubts about the government's preparedness for rolling out GST from July 1 and asked industry to fall in line as there will be no change in the date of implementation of the new indirect tax regime. "GST decisions are all taken by consensus and so far we have succeeded in maintaining the consensus. In the Srinagar meeting of the Council, ministers of almost all states who spoke to me were absolutely clear on maintaining the July 1 date. We are in a state of preparedness for July 1," he said. The Finance Minister also said that action under the non-performing assets (NPAs) ordinance relating to bad debts of banks was expected in the next few days in order to tackle the top 40-50 defaulters. "Reserve Bank of India (RBI) earlier under its rules was making efforts. 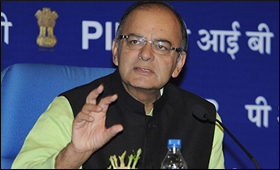 Now, in the next few days, the action plan under the ordinance ... there may be active work under it in the next few days," Jaitley said. "There are no NPAs in MUDRA (Micro Units Development and Refinance Agency) loans. NPAs are only for 40-50 big accounts," he added.